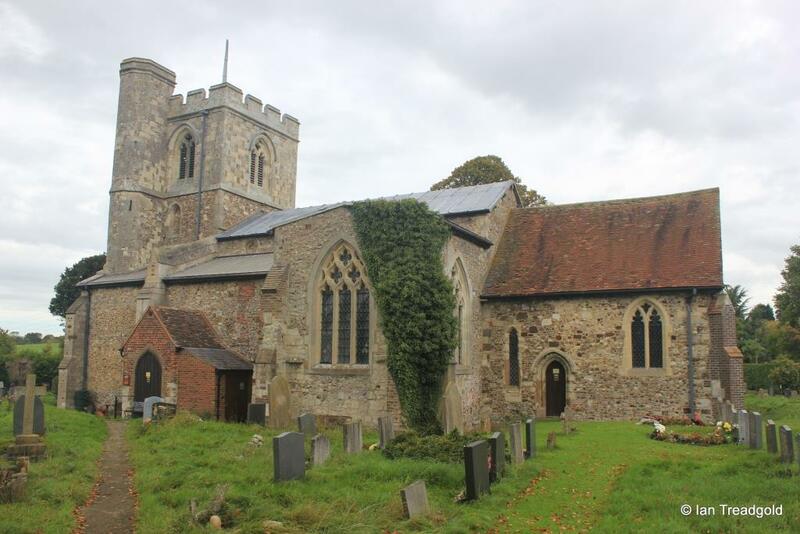 The church of St Mary’s in Sundon is situated to the south of the two villages of Upper and Lower Sundon on the busy Sundon Road to the north of Leagrave. 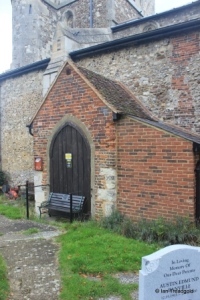 Parking is available in the church car park on the opposite side of the road. 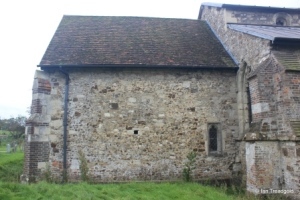 The church consists of a nave and chancel, north and south aisles with a south transept, a west tower and a closed south porch. The chancel is around 26 feet by some 17 feet with the nave adding a further 58 feet with the aisles giving a width of around 33 feet. The transept is some 9 feet by 12 feet and the tower around 19 feet square and some 50 feet in height. 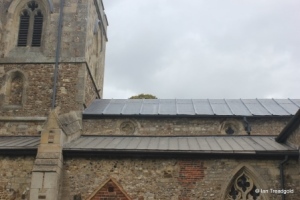 The origins of the current building date to the late C13 and early C14 with the chancel being rebuilt in C15. 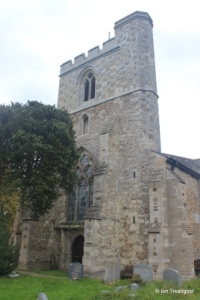 The upper stage of the tower also dates from the C15 period. 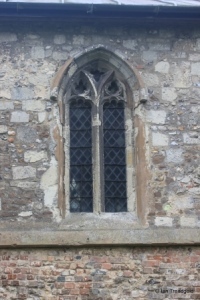 The closed south porch dates from C19, replacing a larger version at that time. 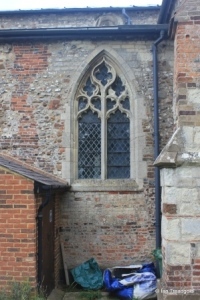 The south side of the chancel has a window to the south-east and a single light window to the west of the priest’s door. 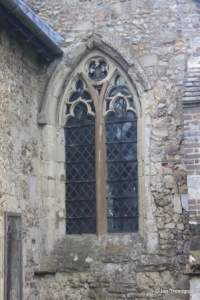 The south-east window is a modern copy and is of three cinquefoiled lights with a quatrefoil design above under a two-centred arch. 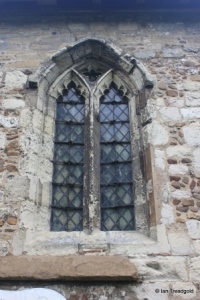 The western window is a single cinquefoiled light that appears to have been extended downwards towards a now blocked low level window which was possibly a leper’s squint to view the service in the chancel. 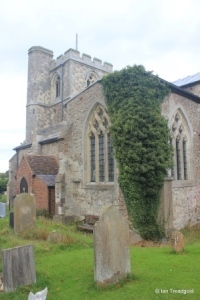 The south transept has windows to the east and south and a healthy crop of ivy on the south-east angle. 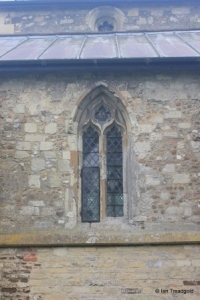 The two windows are identical in design with each being of three trefoiled lights with three quatrefoil designs in the net tracery above under two-centred arches. 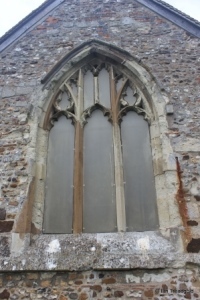 The south aisle has a single window next to the transept and to the east of the porch. It consists of two wide cinquefoiled lights with geometric tracery above with quatrefoil designs under a pointed arch. 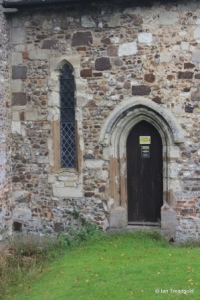 The south porch is a C19 addition and is now blocked off. 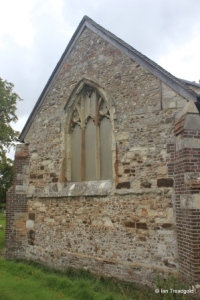 It clearly dates from a similar period to repairs to the south aisle being made of the same brick. 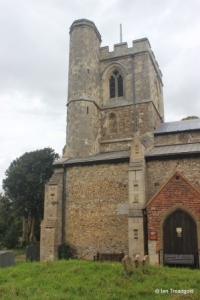 Images of the church from around 1815 show a much grander affair being taller and deeper and more suited to the original fabric of the church. The shallow clerestory over the nave has six circular quatrefoil windows although the two western openings are both blocked. 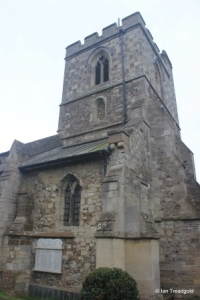 The tower is of two stages with the upper being added in C15 with a chequerboard effect in the masonry. 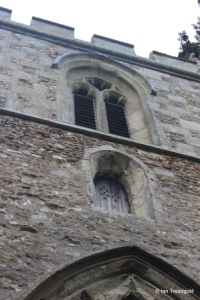 There is an internally accessed stair turret in the south-west corner. 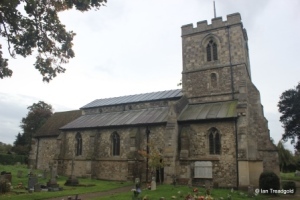 Unusually, the tower sits within the aisles providing a wide west end to the church with buttresses enclosing the west door and window. 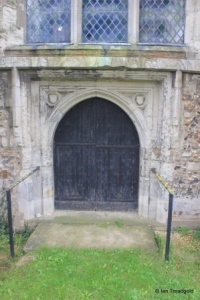 The west door is wide under a square head with shields in the spandrels. 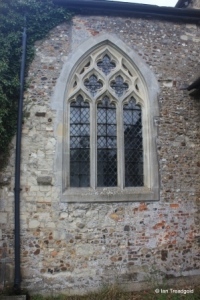 The imposing west window sits directly on top of the door head and is of three trefoiled lights with quatrefoil designs in the net tracery above under a two-centred arch. Below the belfry openings are window openings to the south, west and north of which, only the western opening is not filled in. The belfry openings are of two trefoiled lights with quatrefoil designs under two-centred arches. 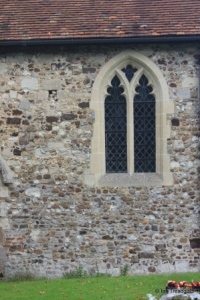 The north aisle of the church has one window to the west of the north doorway and two to the east as well as an east window to the aisle. The three windows are all similar and yet different. They are all of two lights under two-centred or pointed arches. The western has two cinquefoiled lights with a quatrefoil design above. 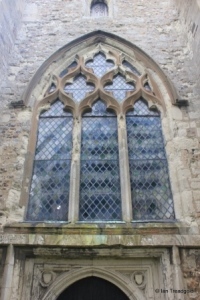 The central window has two trefoiled lights with quatrefoils within the heads of the lights and a further quatrefoil above whilst the eastern window has trefoiled lights with unpierced tracery and a quatrefoil design. The east window of the aisle is interesting for the complexity of the tracery. It has two trefoiled lights with trefoils over the lights with a round quatrefoil design in the head with foliate cusps. 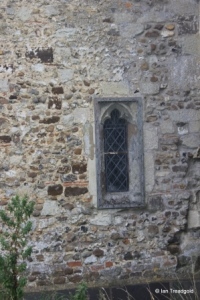 The north side of the chancel has just a single low window at the west end of the chancel. It consists of a single trefoiled light under a square head. 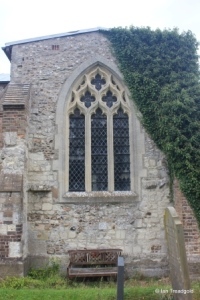 The east window is now boarded but is of three cinquefoiled lights with perpendicular tracery above under a two-centred arch.